Small (6-12 months) - $54.99 Only 1 left! Whooo is that little cutie over there? Hint: it could be your little cutie all dolled up! Let's face it. You've got thousands of options for dressing up your little tyke. And best yet? Your little one is too young to pick what they want to wear, so you get pick the outfits! You could make them a tiny superhero or villain, a miniature conductor or fairy. You could dress them as your favorite Jedi, wizard, or doctor. But if we're being honest here (and we pride ourselves on our honesty), we've got a soft spot for dressing up babies and toddlers as animals. What's better than seeing a poofy little penguin trying to climb up a chair? Or a little kitten curled up in the car seat? Which is why we have this Infant Hoot Owl Costume. Put your little one in this outfit and they're instantly a colorful wide-eyed owl! This outfit has a brown jumpsuit with blue and green feathers layered in the front, little sleeves that look like wings, and orange booties to look like owl feet (with convenient no-skid bottoms). There's even a little owl hat that fastens under the chin with a beak, big owl eyes, and ear tufts. So the correct answer? That little cutie over there will definitely be your kid. 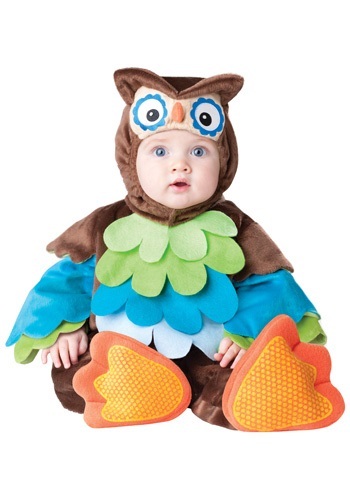 Once in this little Infant Hoot Owl Costume, everyone will be pointing them out. That's who.